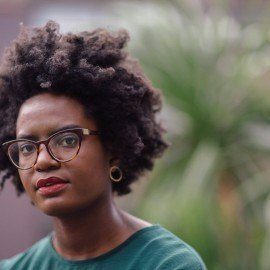 Reni Eddo-Lodge is a London-based, award-winning journalist. She has written for the New York Times, the Voice, Daily Telegraph, Guardian, Independent, Stylist, Inside Housing, the Pool, Dazed and Confused, and the New Humanist. She is the winner of a Women of the World Bold Moves Award, an MHP 30 to Watch Award and was chosen as one of the Top 30 Young People in Digital Media by the Guardian in 2014. She has also been listed in Elle‘s 100 Inspirational Women list, and The Root‘s 30 Black Viral Voices Under 30. She contributed to The Good Immigrant. 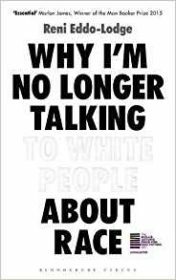 Why I’m No Longer Talking to White People about Race is her first book. It won the 2018 Jhalak Prize, was chosen as Foyles Non-Fiction Book of the Year and Blackwell’s Non-Fiction Book of the Year, was longlisted for the Baillie Gifford Prize and the Orwell Prize and shortlisted for the British Book Awards Non-Fiction Narrative Book of the Year and the Books Are My Bag Readers Award for Non-Fiction.